I've gotten familiar with Becker through the syndication. Not familiar with "Cheers". Well, among those who are familiar with CHEERS I received a request to talk about the set. We filmed CHEERS on Stage 25 at Paramount Studios in Hollywood (but the seedier section of Hollywood). The set was designed by Richard Sylbert, an Academy Award winner whose credits include CHINATOWN, REDS, WHOSE AFRAID OF VIRGINIA WOOLF, ROSEMARY’S BABY, THE GRADUATE, and (ironically) LILITH. It was patterned after the Bull & Finch bar in Boston. 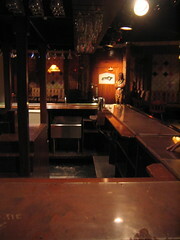 But the B&F is much smaller, and the bar itself is up against the back wall. The décor, Tiffany lamps, and stained glass is true to the B&F. Director James Burrows had a lot of input into the design which is why it was so easy to shoot in it. You could bring cameras way up into the set, get many different and interesting angles, and even get shots all the way down the hall. If you look closely you’ll notice a line that runs down the center of the bar. It’s on a hinge and actually the right half can swing around, allowing room for the right wall to swing back revealing Sam’s office. There are lights underneath the bar pointing up. It was hard in the first few episodes to see Ted Danson’s eyes. Nick Colasanto always had a tough time memorizing the script. There were dozens of his lines hidden underneath the bar. The bar was functional. The CHEERS set was the best ever for show parties. Whenever an outside set is needed the pool room set is struck. There is a fourth wall section that was used a couple of times in the first season. The audience bleachers sat 200. They were raised so even the front row could see over the cameras. To one side was a platform where a small band would play between scenes. The beer served on tap was warm 3.2 beer. Do not envy George Wendt having to drink that swill every week. The set was huge. If we wanted to pack the bar we needed 500 people. For our routine customers we used 30-40 extras. Anything else and the bar looked empty. The guy who had the hardest job on the series was the prop master. Imagine keeping track of all the glasses, drinks, bowls, trays, pretzels, 5.457.432 lemons that Ted cut up every episode, etc. The phone on the bar would move from end to end depending upon where we needed it. The Wurlitzer jukebox was not functional. The piano was. The set was lit differently after the first couple of episodes. Brighter, more inviting. If you have the DVD of the first season, notice the difference between the pilot and episodes later in the year. In an effort to save money during our first season (when we were getting killed in the ratings not only by SIMON & SIMON but by TUCKER’S WITCH for Godsakes) the studio requested we start shooting the show on tape. A test scene was taped and the set looked ghastly. So much for that brilliant experiment. The photo over the bar that is supposed to be Sam is really Boston Cy Young winning pitcher Jim Lonborg. The wooden Indian at the front door was named Techumsa. When the series finally wrapped I walked over to the stage to watch them strike the set. It was so upsetting I left after maybe two minutes. Of all the shows I worked on, CHEERS was my favorite. And no, I didn’t steal anything from the set. And yes, I’m an idiot. I should have. At least Techumsa. I remember that the Coach passed away shortly after one of the Hill Street Blues characters died and then Night Court lost Selma Diamond. It was one tragedy after another for the Peacock Network. Hey, Ken. I'm one of your new readers, coming over from LM a few days ago. Very much enjoy reading you. I was a huge Cheers fan. I remember the first episode (surprised that I actually laughed out loud at a sitcom) and the last. And so many in between. First time I've ever been able to say to anyone involved in that show - thanks for the memories! Fun, fascinating post. Thanks for the inside look. Though I could have done without that "Seedier parts of Hollywood" remark. During the first two years CHEERS was on the air, I was living less than 100 yards from stage 25 at Paramount. I saw the CHEERS sign over the audience entrance every day. And I found the neighborhood quite pleasant, and full of friendly families. I enjoyed living there, and on pleasant Sunday afternoons, I used to enjoy strolling through Hollywood Memorial Cemetary across the fence from Paramount, often sitting on Tyrone Power (His Memorial is a marble bench.) to have a cigarette. I don't live in Hollywood anymore, and I haven't had a cigarette in 16 years, but I remember those days fondly, and am glad that CHEERS is still around in reruns to take me back. More CHEERS stories always welcome. When I consulted on WINGS our writing room was on the second floor of a building on Gower. At night we would see an ice cream truck pull up and watch drug deals go down. We used to call the ice cream man Cracky the Clown. Hey! It's like old home week! I was that guy selling the drugs! !Ha ha! Small world, eh? Ken,Great info. Have already told my experience of my few moments on the CHEERS set in one of your previous posts, but I wonder if you noticed the pile of scripts that had been tossed away next to the bleachers after filming the last show. When Rudy Hornish was taking me on a tour of the nearly completed FRASIER set on Stage 25, we noticed this small mountain of paper as we got to the staircase. "You want a CHEERS script?" Rudy laughed as we passed by it. Never one to pass up freebies, I picked one up off the top and can now claim to be the proud owner of a copy of "Woody Gets an Election", an episode from the final season (and an episode in which, I believe, Peri Gilpin appears as a newspaper reporter). I think it's a testament to the audience's identification with the show that the set continues to stand (most of it, anyway) at the Hollywood Entertainment Museum on Hollywood Blvd. The only part of that tour that's worth the measly admission price. I always marvelled at the reality of the Cheers bar with two glaring exceptions: Nobody smoked and nobody paid.An 80s dream bar if there ever was one. Practicality is everything in set design. Bob Schiller once told me that the set used for Ricky and Lucy's house in Connecticut on the last episodes of "I Love Lucy" was gorgeous, and everyone initially loved it because it was huge compared to the small apartment sets they'd had, but it quickly became a pain. That big flight of stairs made quick entrances and exits on the things impossible. Likewise, the front door was so far from where the action was staged that it took forever for someone to enter or leave the house by it, so another door was added in the dining room area, and it actually got used more than the front door. Not to mention that all the furniture required to fill the set up tended to get in the way of staging action scenes. They learned to appreciate that little apartment set much more than they had. I served behind the Cheers bar at the Hollywood Entertainment Museum back in my bartending days. A group of doctors from out of town where given a private tour of the museum and spent an hour drinking at the exhibit. It was an awesome experience, except for the 'Norm' shouts every three seconds. Well, WINGS was after I'd moved away. Too bad. That truck would have been so convenient. The house filmed for the exterior of the Sugarbaker Design Firm on Designing Women is here in the town where I live. As part of our city's historic district, it was open for tours for many years, and after the series premiered, it was not uncommon for visitors to complain that they were disappointed that the interior bore not the least resemblance to the set seen on Women. Some actually believed the show was filmed there and expected to see the cast at work! Allan...you forgot to mention that while DESIGNING WOMEN is set in Atlanta, the "Sugarbaker house" is in Little Rock.